I love our homeschool group because we get to paint our handprints. That are red. 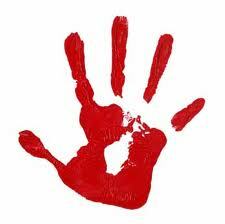 Everybody loves my pretty handprints that are red. All because they love my red handprints that stick on the paper and wash off. If somebody sees my handprints they say, "Oh, I love the handprints of everybody." By the way if somebody knows me, I know how to do ballerinas. And if somebody knows me, I do a curtsey if somebody bows down for me. About our homeschool group, there is a fence that can play with balls. Monkey loves balls, blue and red. By the way, mommy gave me a book I can have for reading. I dropped it and hurt my toe. And I love mommy because she teaches my school.